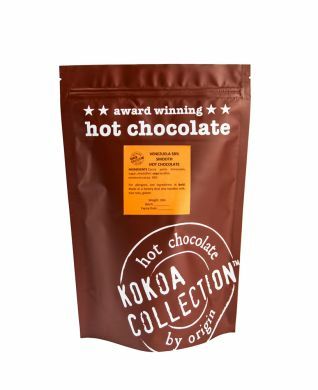 Trade packet of Kokoa Collection hot chocolate tablets. Venezula is a classic vegan hot chocolate with 58% cocoa, light and sweet with fruity notes. The Venezuelan cocoa we use for this hot chocolate are a mix of two varieties criollo and trinitario beans. They are selected from three quite beautiful regions - Sucre, Sur de Lago & Barlovento. Acadamy of Chocolate, Bronze Award winner. I started with the 58% Venezuelan. This was a delightful chocolate with interesting slightly fruity notes that I really enjoyed. It was lovely and I have to admit it was really extremely typical of chocolate from this region. It still retained its distinctive flavour and yet was a hot chocolate - BLOW MY MIND! It has no added milk it's just lighter and sweeter. I'd eat the chocolate on its own and I'd for sure buy this as a hot chocolate! Cocoa paste Venezuela, sugar, emulsifier: soya lecithin, min. cocoa content: 58%.